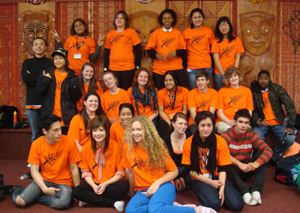 Two weeks ago I got a call that the university was willing to sponsor me to go to the 2008 National Youth Diversity Forum in Auckland. The theme of this year’s forum was “Finding Common Ground”. I was pretty nervous, but I figured if they were willing to pay I was obliged to take such a great opportunity. I’m not really a forum person. I don’t give speeches, I don’t keep abreast of politics, I don’t… I’m just not a forum person. So I was pretty nervous. In the end it was pretty awesome! I’m really glad my friend Joe from uni was able to come too, so I didn’t have to be there by myself >..< But we met heaps of awesome people (most of whom were a lot younger than I expected!) and it was really interesting to meet them in that context, where we could talk openly about issues relating to diversity. Plus we had fun. Sssssh. The culmination of the forum was to present the 2008 “Youth Challenge” to the Plenary forum. I still don’t know what “plenary” means, and since the Prime Minister left as soon as we’d pimped the report they wanted us to read out I felt like our slot was a filler and we were the token “young people”. Didn’t feel good. But the hosts of the event – Marama, the folks at the MIT marae, MCs Ronji and “Nolz” – were so nice and took us seriously. In a real genuine way. And I’m really grateful for that. I had a great weekend and learned a lot. Something I really appreciated was the way they supported each of us, and we were not asked or pressured to do anything that we didn’t feel comfortable doing. Each of the leaders really respected us and really cared that we were represented honestly and not used. One of the trips we went on as part of the forum was to the 佛光山 Fo Guang Shan Buddist temple. It was really amazing – a huge complex with impressive shrines, teaching facilities, dining halls, tea cafe, and beautiful gardens. 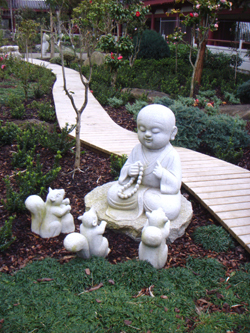 The whole site took 4 years and $33 million to complete, and is the largest Buddist temple in the southern hemisphere. We had guides to show us round – professional Chinese styles, complete with handless mics. It was really interesting hearing them explain about the Tang dynasty architecture and features of the tmeple as well as the traditions observed there and significance of certain areas and customs. I loved the statues of “novices” around the inner courtyard, they were so cute! And while we were there a small of group Chinese kids finished class and ran home with their schoolbags across the courtyard and out the front entrance. I had a moment where I was really happy ‘cos I could imagine these kids looking back on those classes in 10 years time the same way I look back on my Girls Brigade meetings. It was like looking at the perpetuation of Chinese culture in New Zealand. I just found in really hopeful. It was really amazing to visit that place, and especially interesting to discuss the experience afterwards as a group who had entered the temple from a variety of backgrounds. I wanna thank everyone who was there, “delegates” and leaders. It was a great experience. I wants a snuggle suit! This is probably my favourite ad on New Zealand television at the moment. It’s so warm and fuzzy! If you havn’t seen it before, see if you can guess what’s it’s advertising before the end of the clip! When I was cleaning out some old boxes last week I found this funny e-mail I received years and years ago (I think from you, Mel!). 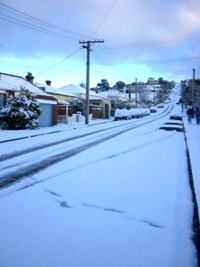 I want to throw it out because it’s part of the clutter, but with the recent spate of freezing weather New Zealand’s been getting recently I thought it’d be appropriate to share it on here first. 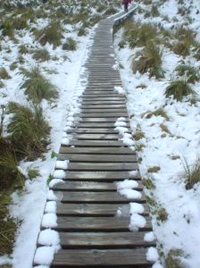 New Zealanders will get it better than others – Canterbury is a region in the South Island of New Zealand and the people down there, Cantabrians (“Cantabs”), fancy themselves much more staunch and strong than the rest of New Zealand! Today bf and I watched the movie Juno. The soundtrack was really cool and included several tracks by Kimya Dawson, an artist who I’d never come across before. Each of her songs that I’ve heard is really distinctive, and yet at the same time really personal. Simple, but at the same time totally new and fun. I’m tired and it’s hard to explain what I mean, but it’s as if you went, “I think I’ll write a song about how I’m feeling right now”, and you just started singing. And the tune is light, and the song’s easy to listen to, but you can say and sing whatever and however you want, because it’s your song. Within the format of the song it even sort of incoporates bars of other songs that you’ve known forever, including hits by Tom Cochrane, Willie Nelson, Bette Midler, the Goo Goo Dolls and Third-Eye Blind (well that’s what I hear, anyway). I think it’s a seriously awesome technique in the song because it makes it reflect life – just like the song life is punctuated by tunes and songs that I’ve always known, or that are associated with certain memories, or that just pop into your head at inopportune moments, even though you only know a couple of bars or just the chorus, and they are a part of your life. Kimya knows what I mean. Full lyrics for the song, from the album Remember That I Love You, are on Kimya’s website, and you can listen to the song here on YouTube. And for those of you who are wondering, apparently an elephant ear is a big hunk of deep-fried, sugar coated dough. Now you’re talkin’ ma language! Just in case you, like me, have had your bed and television… stolen is such a harsh word… pilfered on this night of nights and you, like me, are in your hovel of a room with no decent sleeping place and no olympic coverage – fear not! Grab a blanket and a pillow, set the back of your computer chair right back and click through to TVNZ. Thanks Mel for the great idea – time to waste the 6.5hrs till I have to get up! 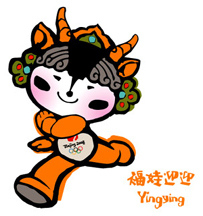 Everyone say “你好!” to the 2008 olympic mascots! Aren’t they cute? 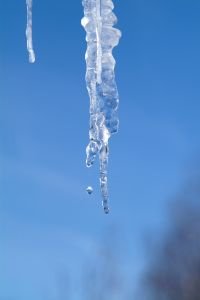 They are called the “福娃”, the “Fúwá“! 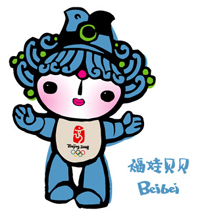 Fúwá literally means “good luck dolls” or “dolls of blessing” and they were designed by a famous Chinese artist called 韩美林 Han Meilin. 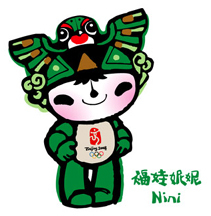 Like previous olympic mascots such as the ’04 Athens mascots, they’re locally inspired representations of native culture – but in my opinion these are 10 times cuter!! (See aforementioned Athens mascots). Together they represent the 5 Olympic rings, the 5 Elements, and are ambassadors of the Olympic message “One World, One Dream”; individually they each have their own image, personality and respresent different aspects of Chinese culture. 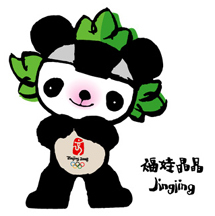 Black Olympic ring / Forest / Giant panda & lotus porcelin / Happiness / Honest and optimistic / Weightlifting, judo etc. 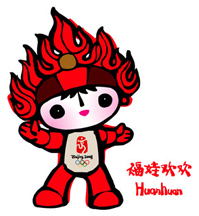 The Fúwá are very childlike in appearance and personality, and in the year before the Olympics there has been a kids show on Chinese TV featuring the Fúwá called The Olympic Adventures of Fuwa 福娃奥运漫游记. I don’t know if that what the clip below is… but it’s freakin’ cute!! For more information about the sweet Fúwá visit this official page or this page on Wikipedia.